Outgoing United States Ambassador to Guyana Perry Holloway on Tuesday said that over the next two to three years Guyana should see better results from both local law enforcement and their collaboration with international authorities in the fight against the drug trade. “I think, my gut feeling is, that things have gotten a little better as far as the big, big [drug] shipments going through Guyana. But, quite frankly, in some ways, other than what we heard from journalists, like you guys… Guyana was the black hole. No one had any clue what was going through, where it was going, and how it was going, [and] who was doing it. So now, after three years with DEA here, we are beginning to develop some stuff. But I think in the next two or three years you are going to see a lot more even more positive actions coming from your law enforcement entities and them cooperating with international law enforcement,” Holloway told reporters during an exit interview. The United States’ Drug Enforcement Administration (DEA) established an office here in 2016, one year after Holloway began his three-year tour of duty. It followed years of failed attempts to establish a DEA office, for which the former PPP/C government faced numerous criticisms. 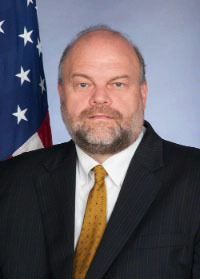 Holloway, who has over 15 years’ experience working on counter-narcotics programmes in various countries, including Colombia, had said in his first interview with this newspaper, in 2015, that joint efforts by the United States and Guyana to bring down drug lords and traffickers would not be a “quick-fix” and could take years. He also said that although America’s leading anti-narcotics agency was about to have a firm footing here, it had to be complemented by political will and a concerted effort of the citizenry. Holloway reiterated his initial position, saying that patience and lots of work is needed to bring down criminal organisations and drug kingpins. In this regard, he is optimistic that joint efforts between his country and Guyana’s law enforcement agencies will yield positive results in the near future. He said that while it was difficult for him to gauge the success of the DEA’s presence here “in a concrete analytical way,” as it is still very early, “One of the things I said when I got here is the investigation of narcotics crime and the related crime of money laundering, these investigations take years and not weeks or months. So if you’re going to bring down an organisation or a kingpin-type person, you don’t do that in a week or two week,” he noted. As he highlighted the successes of the DEA’s presence here, Holloway cited the recent extradition of Guyanese hotelier Shervington ‘Big Head’ Lovell, who was held in Jamaica, following an elaborate operation spanning several countries and where the DEA played a major role. “The DEA, I think, has done a great job in here. They are not policemen, they are liaison; they are here to share information, develop information, talk to people. We did have a recent case of Mr. [Lovell]. He is actually in the US [now] but that came about as information developed here between DEA, CANU, and the Guyana Police Force. It just so happens he was arrested in Jamaica. But there was a lot of reasons for that. He was meeting up with some other guys, so it was a way to get everybody in one place at one time. That has been a small success story,” he said. 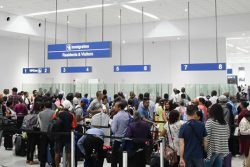 Holloway added that the US has always known that Guyana was used as a transshipment point for the drug trade, but there was not enough concrete evidence to get convictions before. “We knew before Guyana was a transshipment point, we knew certain individuals and organisations were operating in Guyana, just as the Guyanese persons knew. But it is hard to prove. So, by coming here, we gathered a lot more information on those organisations and individuals, we have been working closely and can actually share information that we have with the police and CANU,” he said. Holloway noted that he has seen no evidence that transshipment has gotten worse since he arrived but he noted that it continues to be a problem for the South American continent as a whole. “I must tell you that it hasn’t ended; there is still drugs shipping through Guyana; there is drugs shipping through every country in South America. So Guyana is not alone in being a transshipment point; most countries in the region are… Guyana is so large and so under-populated. I mean, there are so many places you can slip in and out if you have the money and resources. And these guys are well funded and they don’t have to play by the rules,” he noted. With United States-based Guyanese murder accused Marcus Bisram expected to be extradited to Guyana and fugitive murder accused Troy Thomas expected to be extradited to the United States, Holloway said an increase in such cases is also likely. Bisram has pursued all legal avenues to avoid being extradited to Guyana to answer a charge of murder over the killing of Number 70 Village carpenter Faiyaz Narinedatt. Bisram and five others have been charged with the murder. Police have alleged that he procured and commanded Orlando Dickie, Radesh Motie, Diodath Datt, Harri Paul Parsram, and Niran Yacoob to murder Narinedatt between October 31st and November 1st, 2016, at Number 70 Village, Berbice. Meanwhile, Thomas, of South Ozone Park, Queens, New York, USA, who was apprehended in March this year by ranks of the Guyana Police Force, is wanted for allegedly murdering Keith Frank on December 11th, 2011. He had appealed to the High Court to have a stay in his extradition hearing but in June of this year lost that challenge and he was recently ordered to be extradited. Like narcotics cases, Holloway said, extraditions take time as persons will try every legal route to remain in the country they are in. He cited the legal manoeuvring by Bisram and Thomas and lamented that he could not see the arrival or departure of either as he leaves this weekend. “But I think it sends a message to everyone that not everyone gets away with it. There are people who get away with it but not forever. There are people who regularly try to flee Guyana and go to the States or somewhere else. If the request is done in the proper way, with the right legal documents attached to it, and we think there is the likelihood there is a fair trial in the country requesting that, it is likely that they will be extradited. I think once those two guys go back and forth, I think you will see more in both directions,” he added.